The newly-formed Welsh Guards see action for the first time at the Battle of Loos. On the evening of the 27th of September, they try to capture an area of high ground called Hill 70. Captain Osmond Williams, son of Sir Arthur Osmond Williams, 1st Baronet and Liberal Member of Parliament for Merioneth (1900-1910), died from wounds sustained during the battle. The Battle of Loos is also important because the British use poison gas for the first time. 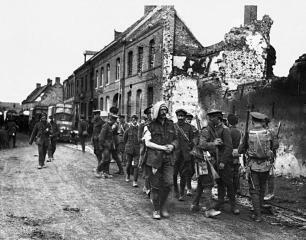 They make some gains against the Germans but suffer 50,000 casualties.